Montero - Raider 2.6 Turbo Conversion Kits. We have finished the development on this kit and have been driving our Montero in the many different forms for almost 6 months. It works great and delivers outstanding and reliable performance. We are taking orders for the kits and they are being built on a per order basis at this time. 3-4 week build time once you place the order. It may actually be quicker but due to the backlog we have already that is a realistic time frame. 50% deposit when ordering and the balance due when it ships. 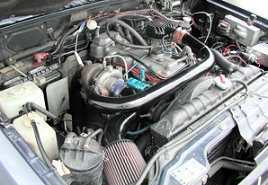 We are also developing a Fuel Injection System (Not a transplanted Starion system.) with programmable management and a single throttle body. This will be available next year. The Basic kit: 160 HP at 3800 RPM and 170 Ft lbs Torque. 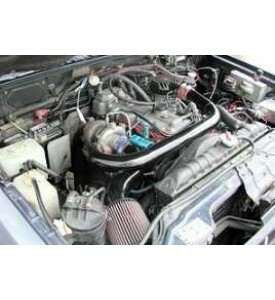 It is designed for Stock engines and Includes. New 14G Turbocharger set at 6 psi boost. 2.5" Downpipe with mating flange to be adapted to your existing exhaust system. We Recommend running a 2.5" Exhaust system with a High Flow Catalytic Converter and Free Flow muffler for maximum performance. If you are in an area that does not require Smog Inspections then do not run a Catalyst and there is a 8-10 HP increase from a straight through 2.5" system. Blow Through Carb top bonnett. Stage 2 Kit: 190 HP and 180 Ft lbs Torque. It is designed for Stock engines. Stage-3 Kit: 220 HP and 200 Ft lbs Torque. Designed for Modified Engines. Forged Pistons, ARP Head Studs, Metal Head Gasket, Non-Jet Valve Head. This clutch will allow you to use the Stock 225mm Flywheel and have enough clamping force to hold 250+ HP and turn large Off-Raod tires with no slipping. Easy driving street use. Complete Turbo Clutch Kit (This is not just a Starion Clutch. We have this Pressure Plate made for us for this application.) New TEP Pressure Plate, Disc, Release Bearing and Pilot Bearing. If you are going to be rebuilding it and addding the Turbo you may as well do it right...This will get you the maximum power with all stages of the Turbo kit and allow you upgrade as you go along.